Aikido is a great martial art to study in order to learn self-defence and to gain personal insights and cultural understanding in a non-competitive, non-combative environment. 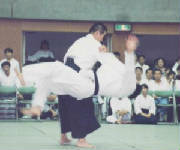 Additionally, Aikido provides an excellent complement or alternative to a regular fitness program. The variety of exercises and training that happens in an Aikido class covers all aspects of fitness. All this is accomplished while being taught in traditional Japanese style by the highest quality teacher.